Recently, I was contacted by an organization called The Kids Cook Monday, which advocates for involving children in the kitchen. I’m a longtime supporter of cooking with kids. 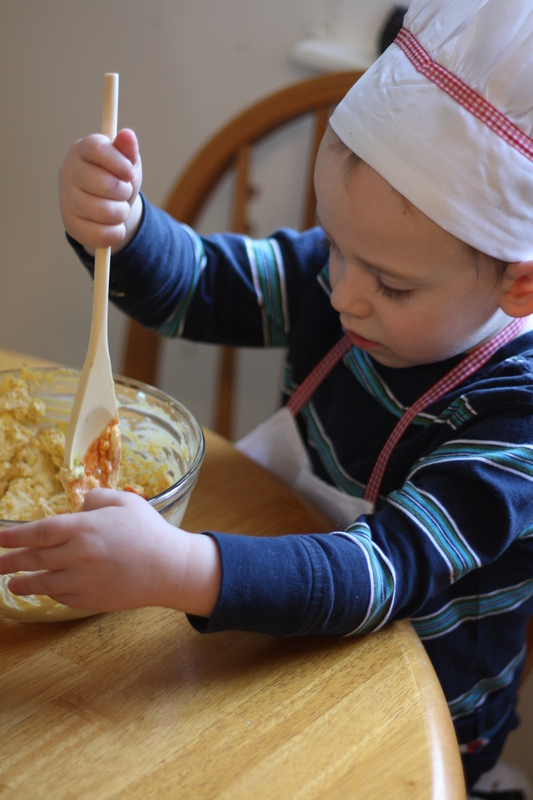 As a parent and educator, I’ve seen firsthand the many benefits which early cooking provides, including building motor skills, developing and practicing mathematical concepts, enhancing language skills, and strengthening social-emotional skills. Furthermore, kids who participate in the cooking process are more likely to experiment with a variety of foods. Here at The Gourmand Mom, my two mini sous chefs are my frequent companions in the kitchen. At the ripe old ages of 2 and 3, they’ve already begun to acquire a depth of culinary knowledge. You’ve already seen my little helpers pop up in previous posts. Some of my recipes have even been directly inspired by the wild imaginations of my tiny chefs (Pepperoni Pizza Salad and Vanilla Soup). As a supporter of The Kids Cook Monday campaign, you’ll be seeing my helpers featured more regularly, ideally once each Monday. The recipes themselves will remain the same. In some way or another, almost everything I post can be seen as a kid-friendly recipe. To me, it doesn’t take hot dogs or PB&J to make a recipe suitable for kids to help. Just about every recipe has got components which would be appropriate for even the littlest hands to assist with. 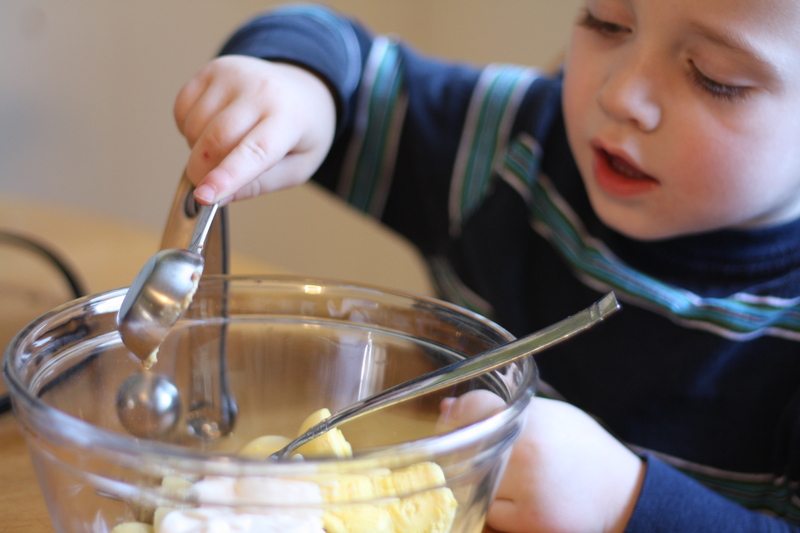 Young children are experts at measuring, stirring, rolling, pouring and smashing. Older children can even begin cutting soft items, like fruits or cheese. There’s almost always some way to get kids of all ages involved in the kitchen. Even modeling techniques and talking through the steps can be engaging and beneficial. This past Friday, while my littlest guy napped, I entered the kitchen to begin preparing a few hors d’oeuvres for our little New Year’s Eve gathering. My three-year-old was content in the living room playing with some of his new toys. I hadn’t planned for a cooking with kids activity. But, within a few minutes, my son had climbed up on a chair to get a closer look at what I was doing and began asking, Is there a special step for me to do? I sent him off to wash his hands and grab the new chef’s hat and apron he received from his great grandmother for Christmas. 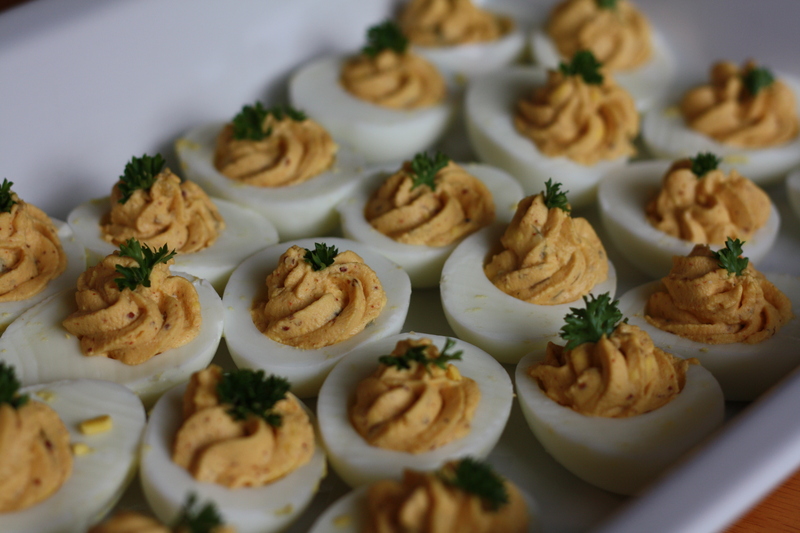 Then, together, we set about preparing the first hors d’oeuvre; Creole Deviled Eggs, a spicy twist on a classic hors d’oeuvre. My petite chef expertly smashed the yolks with a fork, then added and blended the ingredients which I measured for him. He was excited by the relish, which smelled like pickles and the hot sauce, which he claimed his brother would love. I invited him to taste our creation, prior to kicking up the spicy factor, but my hesitant little taste tester refused. Once the filling was complete, he stayed by my side as I spooned our filling into a pastry bag and completed our hors d’oeuvres. Though he was unwilling to taste our creation, he was more then proud to present his homemade hors d’oeuvres to our guests later that evening. 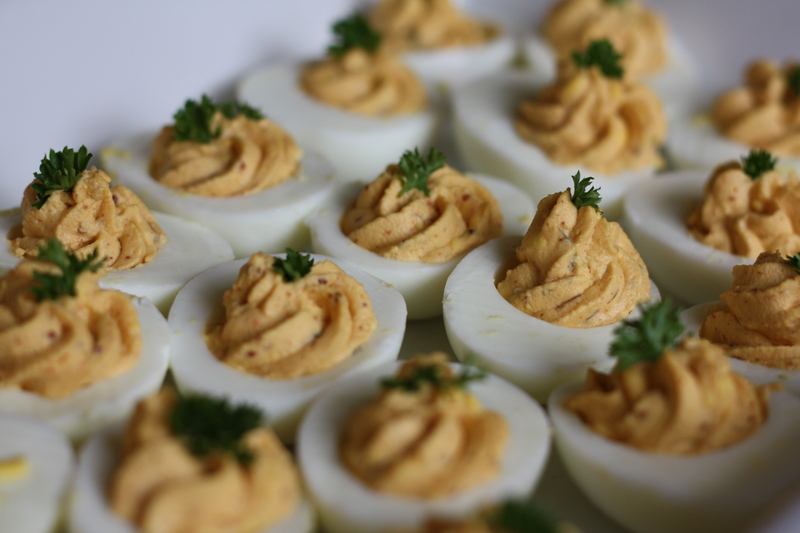 These spicy little eggs make a great addition to any hors d’oeuvres menu. 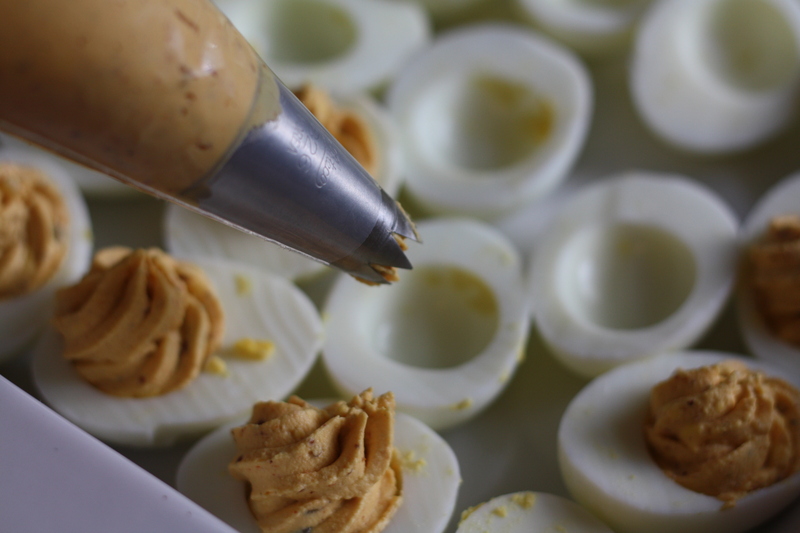 They feature the familiar flavors of classic deviled eggs with just a touch of grown-up spicy flavor. If desired, you can even split the batch and prepare half in the traditional mild-flavored way and half with the added spice. Place the eggs in a saucepan. 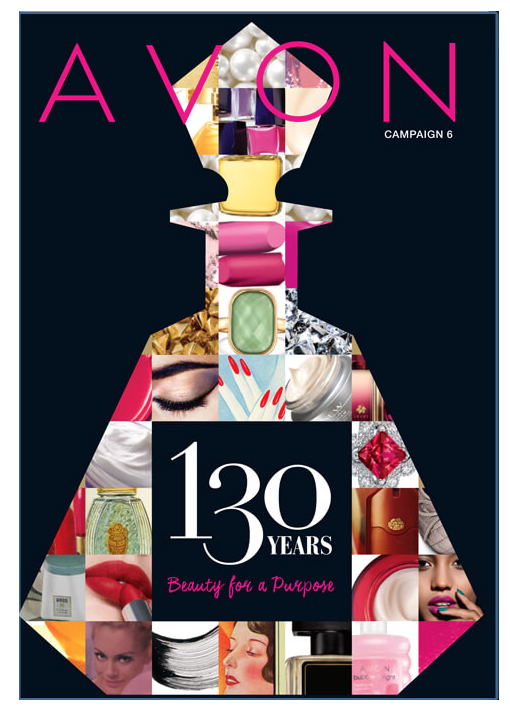 Cover with cold water. Bring to a gentle boil. Boil for about 10 minutes. Then, rinse the eggs under cold water and allow to cool. When cool enough to handle, carefully peel the eggs. Cut each egg in half lengthwise and remove the yolks. Place the yolks in a small mixing bowl and smash with the back of a fork. Combine the egg yolks with mayonnaise, mustard, relish, spices, and hot sauce. Add more or less spice and hot sauce, as desired. Spoon the filling back into the egg whites. For a more elegant result, place the filling into a pastry bag and pipe the filling into the egg whites. Garnish with fresh parsley, if desired. Refrigerate until ready to serve. A little picky-eater tip: When it comes to food, my children can be just as picky as any children, but it doesn’t stop me from exposing them to new flavors or lead me to water-down their meal plans. It can take a child multiple exposures to a new food before they become comfortable with it. Don’t give in to picky eaters. Continue to expose your kiddies to new foods, even foods they’ve vehemently rejected in the past. Typically, when I’m offering something unfamiliar, I pair it with a side of something known and enjoyed. This way, I ensure that everyone has got a little something familiar to fill their bellies, while also providing the opportunity to become more comfortable with a new food. Posted in Appetizers, Cooking with Kids, Eggs, Food, Recipes, Side Dishes and tagged appetizers, Cooking, cooking with kids, family, Food, food photography, hors d'oeuvres, kids, Kids Cook Monday, New Year's Eve, parenting, Recipes. Bookmark the permalink. add “creole” to any dish and I am all over it. My family has a very particular view on deviled eggs (actually two views that they often argue over) so I can’t wait to sneak this in and blow their minds! It’s great you have little helpers too – most kids I know really don’t have much interest in the kitchen, or food. If you place your carton of eggs on its side for a day, the yolks will centre themselves so once boiled you will have them directly in the middle of the white. Cool tip! I didn’t know that!